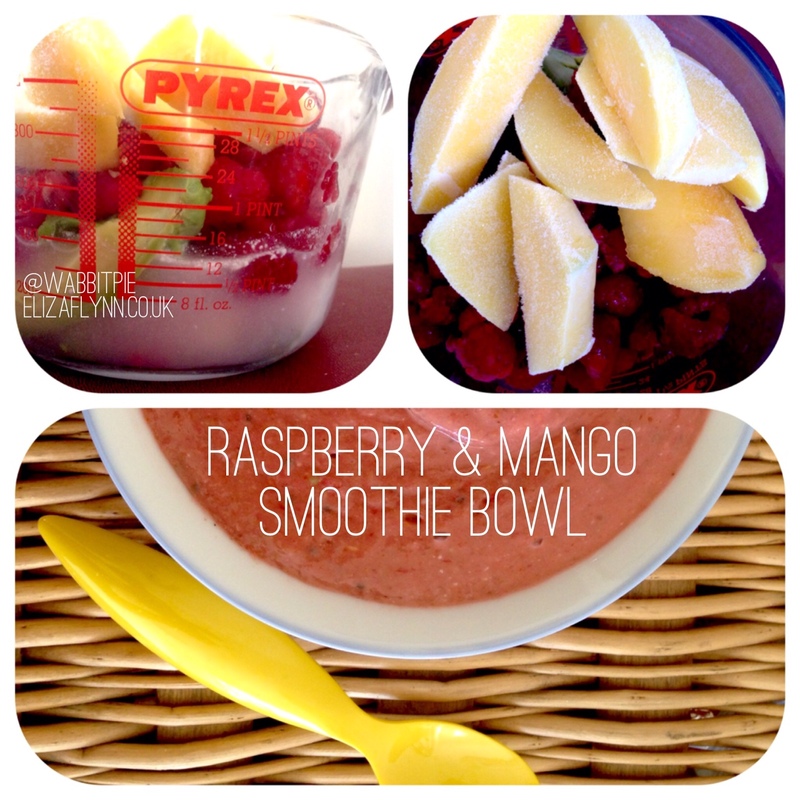 This raspberry and mango smoothie bowl is one of my favourite ways to start my morning. It’s thick, tasty and delicious, especially when you use frozen fruits. Best of all, it takes about 10 minutes to make – just a little bit longer than it’d take to make toast, butter it, and lather it with marmalade. Oh, and don’t forget an extra couple of minutes for the cup of tea. Serve in a bowl, with a brightly coloured spoon. Put all ingredients in a bowl. I prefer, for some reason to add chia seeds and honey last. Raw Oak honey: It’s the ‘raw’ bit of the honey that’s most important. Honey is packed full of natural vitamins, enzymes, and powerful antioxidants. Raw honey is only heated to 40’C, which leaves all these nutrients unharmed. Flaxseed & Goji Berries: I use the Linwoods version. It’s high in protein which contributes to growth and maintenance of muscle and bones. In addition, it’s a great source of fibre and ALA, an essential fatty acid, helps regulate blood cholesterol. Chia seeds: these are silky, little black and white seeds. They’re high in fibre, full of anti-oxidants, can help with blood sugar regulation and can help reduce inflammation. What’s more is that they also help you feel fuller for longer. Raspberries: these are happy fruit – as rich source of Vitamin B and folic acid, they help lift your mood. Perhaps one of the best ingredients for a Monday? They’re also full of antioxidants and contain inflammatory properties.